Look at the graph above this line. It shows the difference between the actual total energy expenditure (TEE) of the participants and the expected value depending on their age, fat mass and fat-free mass. The black diamonds correspond to the people who didn’t lose weight, and the average value matches the prediction. The open circles belong to the energy expenditure from those participants who had just lost 10% of their body weight: 200 to 650 kcal/day less energy expenditure than expected. And the hollow squares correspond to the energy expenditure of those who lost their weight at least one year ago: between 50 and 800 kcal less than expected. These people have an altered metabolism, despite having kept their weight stable for a year. Their body is reluctant to accept the new body weight. An average reduction in expenditure of 450 kcal/day is striking. And this energy reduction must be added to the expected reduction due to weight loss. 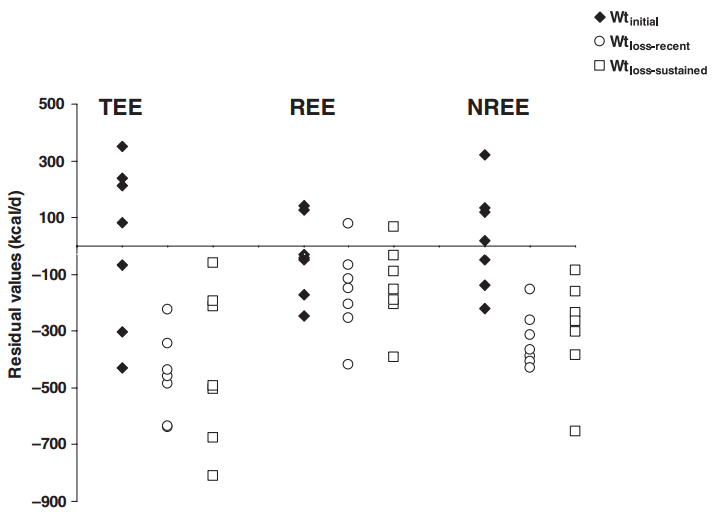 Also shown in the graph are the changes in the resting energy expenditure (REE) and non-resting energy expenditure (NREE) and we can see that just looking at the resting energy expenditure we wouldn’t see the magnitude of the problem. It is the part of non-resting energy expenditure the one that has substantially changed. We can interpret this saying that our body uses the same energy as before to maintain the basic functions, but it has become more efficient at doing any other activity, such as walking. We do the same activity but with less energy than before losing weight. The result of the experiment is that they use far less total energy (TEE) than before, 22% less, as indicated by the gray bars in the graph above this line. And the researchers said that the reduction couldn’t be explained because of the weight reduction. In a 2000 kcal/day diet , a 22% reduction is a reduction in energy expenditure of 440 kcal/day. Therefore, to prevent weight gain they shouldn’t go above 1,600 kal/day. You’d have to eat much less than usual just to keep the weight loss, and that is the number as long as your metabolism is not further reduced because of eating so little. The above graph confirms the idea that the REE, the resting energy expenditure, may not reflect the change that has occurred in metabolism, since in this case the REE even increased a little, when in fact the TEE has decreased dramatically. Another interesting contribution of this study is that it measured the plasmatic levels of leptin, a hormone, and they found that after weight loss the leveles were lower than the baseline levels. That means that because of the weight loss a hormonal change had occurred. The researchers injected leptin into the participants to raise their levels to baseline and found that the energy expenditure of the participants increased, returning almost to baseline values ​​(white bars in the chart above). Hormonal changes induced by caloric restriction do matter. Besides the above, the authors measured the efficiency of the skeletal muscle, and found that it had increased by 23%, approximately. That means that making the same physical effort now needed less energy. b) in the right panel black symbols are used for participants that decreased their body weight by a 10% or 20%. The straight line is the prediction based on the fat-free mass, and we can see that in the left panel, when they gained weight, the actual expenditure was higher than expected (black symbols are on average above the straight line), while on the right panel, when they lost weight, black symbols are below expected values (on average below the straight line). But there is more: the data above was obtained once the weight was lost and it was stable. But while they were losing weight energy expenditure was even lower (10-15% less), and while they were gainning weight energy expenditure was higher (12% more) than the values shown on the graphs above. Our body resists the weight change and also to keep the new weight. I know this article is already quite long, but I find it very interesting. Just a couple of studies and it is over. 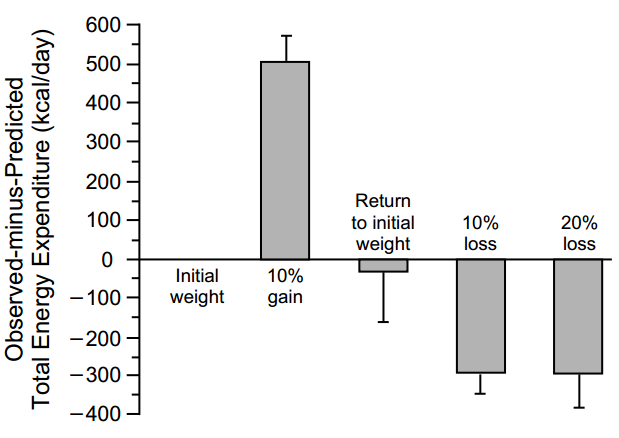 In the first one (“Effects of experimental weight perturbation on skeletal muscle work efficiency, fuel utilization, and biochemistry in human subjects“), participants lost or gained a 10% of their baseline weight. From an energy expenditure of 2750 kcal/day they should have gone down to 2650 kcal/day because of the weight loss. But it fell to 2175 kcal/day. There was an unexpected reduction of 475 kcal/day. Their body spent a total of 575 kcal/day less than at the baseline. Is this the way of losing weight? The decrease of the total energy expenditure was a 20%. They also measured the efficiency of the skeletal muscle, and found that an increased efficiency could explain the 35% decrease of the total energy expenditure. For example, for a 10W workout the expenditure was 1.17 kcal/min in the group that lost a 10% of their body weight, compared with 1.50 kcal/min at baseline. That means, if you lose weight, the physical exercise you do burns fewer calories than those the same physical exercise would burn before losing weight. You deprive your elephant and it gets more out of each available calorie. Finally, in another scientific study (“Greater than predicted decrease in energy expenditure during exercise after body weight loss in obese men“) energy expenditure is measured in participants while they exercise, before and after losing a 10% of the initial body weight. The graph below this lines shows how after losing that amount of weight, a specific physical effort needs 3.71 kcal/min instead of the expected 4.14 kcal/min. Again, the results show that after losing weight the elephant becomes more efficient, and resists both losing weight and keeping it off. Weight loss makes our body more efficient and saver. It spends less, and gets more from what it uses. 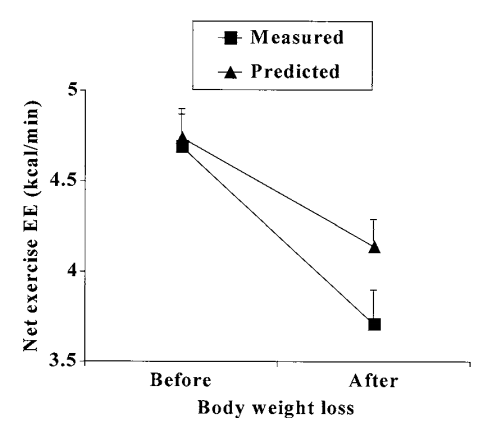 These results may explain why “eat less and move more” doesn’t work for weight loss. The question now is how much is our body altered in the process of losing weight and gaining it back.